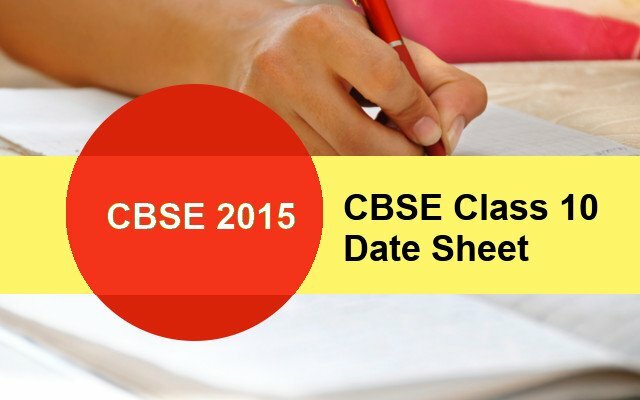 CBSE 2015 Date sheet of class 10 students are now available for download from the official website of CBSE. Students can view the Date Sheet from the website cbse.nic.in. CBSE Exam 2015 for class 10 students will start on 2nd March 2015. The First Topic is IT and related topics. Students who are appearing for CBSE Exam 2015 can prepare and schedule their studies according to the time table. Its is nearly two moths for the exams to begin. CBSE Class 10 Results 2014 are expected to be available on last week of April 2015. Download the Time Table from the Website of CBSE. In the column displaying the Latest @ CBSE, a link at the top says- Datesheet for Main Examination 2015|Class 12| Class 10. Students appearing for Class 10th exam this year can note down the exam schedule as per the subjects they are appearing for. Last year CBSE Class 10th examination was held from March 3 to March 14, 2014. About 13.28 lakh students of CBSE class 10 appeared for the board exams in the year 2014.Like last year, this year also the examinations will be held in the months of March and April. The examination will start at 10:30 AM.